In year 1998 preparation of Greater Noida Master Plan 2021 was started by the Authority. After hearing of public objection/suggestions invited by means of publication of notice in leading newspapers, the Master Plan-2021 was finalised in year 2001 and approved in 41st Board Meeting. The Greater Noida Master Plan-2021 was sent to State Government on 18.12.2001 for approval and thereafter for sending to NCRPB for comments and suggestions. Thereafter, on 4th, September, 2006, Greater Noida Authority was invited to present its Master Plan 2021 before the Planning Committee, NCRPB. Few Observation were raised by Planning Committee on Master Plan 2021. On 28th June 2012 the Greater Noida Master Plan 2021 was approved by the Planning Committee of the NCR Planning Board with 5 conditions. 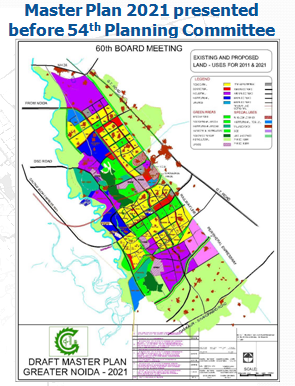 The NCR Planning Board in its meeting on 24th August 2012 approved the Greater Noida Master Plan -2021 with conditions as recommended by the Planning Committee. The Conditions were complied by Greater Noida Authority and finally the Master Plan-2021 of Greater Noida was Notified in March 2013.